In 2018, nearly two out of every three Latin Americans will head to the polls to elect new leaders, and the fight against corruption will be high on their agenda. The surge to throw the bums out could be a harbinger of cleaner politics. But a revival of the region's tradition of populism could also threaten the nascent institutions and mechanisms that are Latin America's best hope for a more honest tomorrow. Voters are rightly enraged about corruption. Nearly every country has seen its share of high-profile scandals. 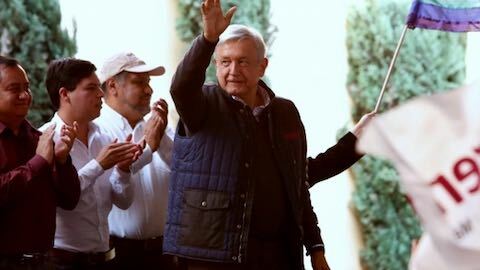 In Mexico, governors have allegedly stolen land, pilfered workers' social security contributions, received public contract kickbacks, and even replaced children's chemotherapy medicine with water to make a buck. In Honduras, tens of millions of dollars have vanished from the social security system under the president's watch. In Brazil a third of the congress, five former presidents, eight cabinet ministers and scores of other officials are under investigation or indictment for bribery and other crimes. Even the supposedly pristine nations of Chile and Costa Rica have been drawn into the muck: President Michelle Bachelet's son was part of a shady real estate deal and all three branches of the Central American government were rocked by a cement import scandal. The aggregate costs of corruption for the region are staggering, leeching tens of billions of dollars each year from the Brazilian and Mexican economies, 3 and 5 percent of gross domestic product respectively. In Colombia, an estimated one out of every 10 public dollars disappears -- equivalent to the entire health budget. Yet corruption's emergence as a major political talking point is largely the result of positive regional trends. Nearly all of the nations are now democracies. The shedding of authoritarian pasts has enabled the rise of a freer press, with intrepid reporters eager to uncover misdeeds. Their investigations, in turn, have benefited from new tools, including freedom of information acts that have opened up public logs to scrutiny. In some countries, hard-fought judicial reforms are also bearing fruit, empowering more professional and autonomous judges and court officials to take down wrongdoers. Bolstering these institutional changes are societal shifts. The growth of a middle class -- now a full third of the region's population -- means tens of millions of citizens are no longer just focused on day-to-day survival. And they are paying taxes that they hate to have disappear. Yet almost daily revelations of malfeasance, combined with excruciatingly slow progress in bringing the perpetrators to justice, have led to disappointment, frustration and real anger with the political establishment. As a result, today's batch of centrist, pragmatic and market-friendly presidents all wallow in the public opinion doldrums -- only Argentina's President Mauricio Macri breaks even on approval ratings. This rising disgust has opened the door again to populist outsiders who use corruption as their new rallying cry. In Honduras, TV personality Salvador Nasralla campaigned on human rights and corruption. In Mexico, Andres Manuel Lopez Obrador hammers his opponents as a political mafia only he can dismantle. In Brazil, though the left remains behind former president Luiz Inácio Lula da Silva despite his corruption conviction, the centrist parties have collapsed under the weight of similar charges. In Colombia, the anti-establishment sentiment is so strong that vice president German Vargas Lleras has cut ties with his party to run on his own. In past decades, Latin America's economic populists have exploited the real gaps between the region's have and have-nots, riding these class tensions into office. Once there, they have used their power to override central bank independence, ignore congressional budget limits, and erode other checks and balances. Their profligate spending cultivated their political base even as it led to spiraling inflation, falling investment and an inevitable economic crash, hurting their supporters more than anyone. If this populist past is any guide, today's anti-corruption crusaders could also make things worse. By trampling legal niceties as they go after those they have identified as past aggressors (usually their political opponents), they could undercut the very slow but real progress that is being made, undermining the transparency and accountability needed to stop similar behavior in their own ranks. In this respect, the recent hurried charges brought against former Argentine president Cristina Fernandez de Kirchner and her cronies are worrisome. Pragmatic, institutionally minded leaders are the only ones equipped to address the underlying reasons for voters' justifiable anger. What Latin American nations need are incremental improvements that strengthen institutions. What they may unfortunately get is leaders with grandiose but empty promises. Latin America: "Populism Looms Over Latin America's Election Year"